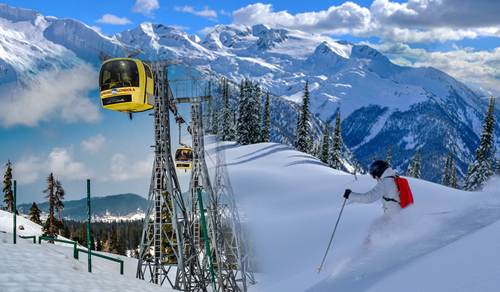 Located in the center of the Kashmir valley, the district of Srinagar towers at a height of 1,730 m above sea level. King Pravarasena-II founded the Srinagar city over 2000 years ago. The Chinese traveler Hiuen Tsang, who visited Kashmir in 631 AD, found Srinagar at the same place where it stands today. The rule of Hindu kings in Kashmir ended in 1339, with the last ruler being Laltaditya Muktapida. From 1420-1470, the valley came under the rule of King Zain-ul-Abidin, popularly known as Budshah. Some time later, Mughal Emperor Akbar annexed Srinagar and included it in his own territory. Come and explore some more fascinating aspects of Srinagar with us! It was during the rule of Akbar only that the district got the striking mosques and gardens that it now proudly boasts of. The last one of the Muslim rulers of Srinagar was overthrown by the Sikhs, under the rule of Maharaja Ranjit Singh in the year 1819. With time, the rule of the Sikhs ended and the Dogras gained the control of Kashmir from the British under the Treaty of Amritsar. After India became independent in the year 1947, the state of Jammu and Kashmir became a part of the Indian Union, with Srinagar as its capital. Since then Srinagar has been a prominent destination on the tourist map of India. The district of Srinagar is situated on either sides of the Jhelum River, making its locales picturesque and beautiful. The major attractions of Srinagar travel include Dal Lake and Nagin Lake. Most of the houseboats (Shikaras) in Kashmir will be seen in these lakes only. 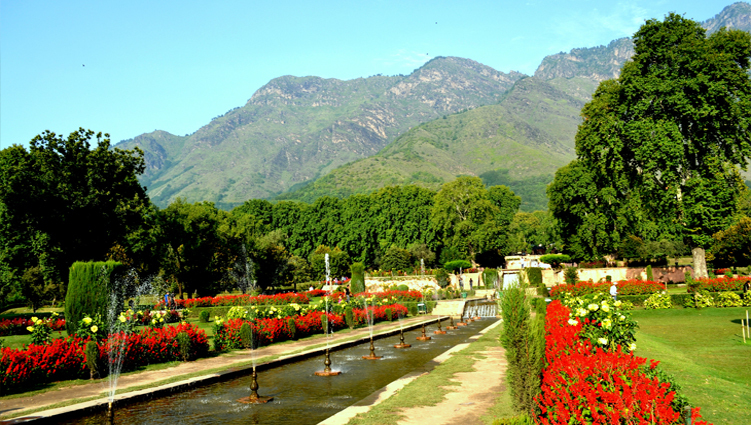 The Mughal Gardens set up by various rulers of the Mughal dynasty further enhance the beauty of Srinagar. 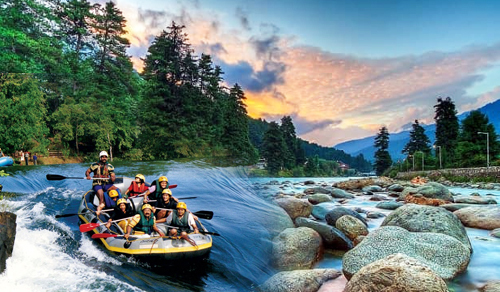 Other major draws of Srinagar are water sports activities, handcrafted souvenirs, amazing resort nearby etc. Tulip flowers are one of the most beautiful flowers available on Earth. It is been said that the Tulip flower is first found in Iran, and is the national flower of Iran. After Rose and Dalia, Tulip is the flower with more demand in the world. The Tulip garden present in Srinagar, the capital of Jammu and Kashmir, India, covers over 75 acres. These flowers are grown in Sirag garden near Dal Lake in Srinagar. 400 men are worked for this Tulip garden to blossom. Here the Tulip flowers are grown in a series of rows, each row with a different color of Tulips. In this Tulip garden of Srinagar, a total sum of 12 lakh Tulip flowers are present, with the Tulip flowers in 60 different colors. Execpt in black and blue, Tulip flowers are available in all other colors. The Tulip flower can hold its freshness for 7 days. A very large landscape covered with thousands of beautiful and colorful flowers arranged in a row is a great view. It is attracting many tourists every year with its beauty and the tourists who entered the garden cannot leave the beautiful scene so easily. This Tulip garden of Srinagar is Asia's largest garden and the second largest in the World. Across the Dal from Shalimar is the mosque of Hazratbal, the only one of its kind architecturally in Kashmir. Made of white marble with a dome and a minaret, Hazratbal is the repository of a single hair of the Prophet Mohammed, exhibited to the public on certain days of the year. 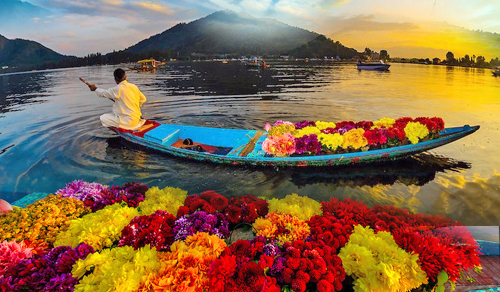 Exquisitely laid out lawns, cascading fountains, bright flower beds, surrounded by the panorama of Dal lake in front of them, the gardens in Kashmir are astoundingly beautiful. The unity and harmony of design; innovative use of the site and plantings and the diverse mixture of colors, textures and plants impart a sense of ecstasy to the viewer. The Mughal gardens of Shalimar, Nishat, Chashmeshahi and others like Pari Mahal and Harwan are like perfectly carved lawns with stepped terraces and flowing watercourses. Shalimar Bagh was built by Emperor Jehangir for his wife Nur Jahan, 'light of the world' in 1616. Although it is known today as the 'garden of love' it was originally named the Farah Bakhsh or 'delightful garden'. A canal is lined with polished stones and is supplied with water from Harwan runs through the middle of the garden. The fourth terrace, by far the best, was once reserved for royal ladies. It included a pavilion made of black stone in the middle of the tank, which was used as a banquet hall. Shalimar Bagh has an air of seclusion and repose, and its rows of fountains and shaded trees seem to recede towards the snowcapped mountains. A Son Et Lumeiere or sound and light show is put on here every evening during the may to october tourist season. Nishat Bagh was built by Empress Nur Jahan's brother Asaf Khan. The largest of the Mughal gardens, Nishat has 12 terraces representing the 12 signs of the zodiac, which descend gradually and seem to almost merge into the lake. These terraces viewed along with the flower-beds, a riot of brilliant colors, present an unforgettable sight. Directly behind the garden is the Gopi Tirth, a small spring gushing forth crystal clear water, which feeds the garden water. Also found within its vicinity are some remains of Mughal period buildings including a double storey pavilion enclosed on two sides latticed windows. Cheshmashahi is the first Mughal Garden you will pass after Nehru Park. Smallest of the Srinagar Mughal gardens, the Chasma Shahi, or 'Royal Spring', are well up the hillside, above the Nehru Memorial Park. The fresh water spring in these pleasant, quieter gardens is reputed to have medicinal properties. The gardens were laid out in 1632 by Ali Mardan Khan and include three terraces, an aqueduct, waterfalls and fountains. The water from the spring supplies the fountains and then goes through the floor of the pavilion and falls to the lower terrace in a fine cascade of five meters, over a polished black stone chute. There is a small shrine, the Chasma Sahibi, near the gardens, which also has a fresh water spring. Pari Mahal, a Buddhist monastery at one time, it was converted into a school of astrology by Dara Shikoh, Mughal Emperor Shah Jehan's eldest son. Pari Mahal gardens are now exclusively maintained by the state government. Built around a small spring, they house exotic flowering plants laid out in terraces surmounted by the ruined arches of a once beautiful building. Pari Mahal is illuminated at night, and can be seen, located on the on the spur of a hill, most places in Srinagar. On the hillside, south of the village Harwan, remarkable remains of ancient ornamented tile pavements of the Buddhist period have come to light. The tiles depict the dresses of the people, such as loose trousers, Turkoman caps or close fitting turbans and large ear-rings which reveal central Asian influence. To add to the fabled beauty of Jammu and Kashmir, is the Dachigam National Park, an enviable beautiful place, a place that will time and again make you regret the fact that you cannot visit the place as often as you would wish to. The wild cherry, apricot, pear, plum, peach and apple trees in full bloom that populate the park makes it one of the most beautiful wildlife sanctuaries in the country. The park is by itself to breath-takingly beautiful that, you hardly have time to think of what wildlife you came across or did not. 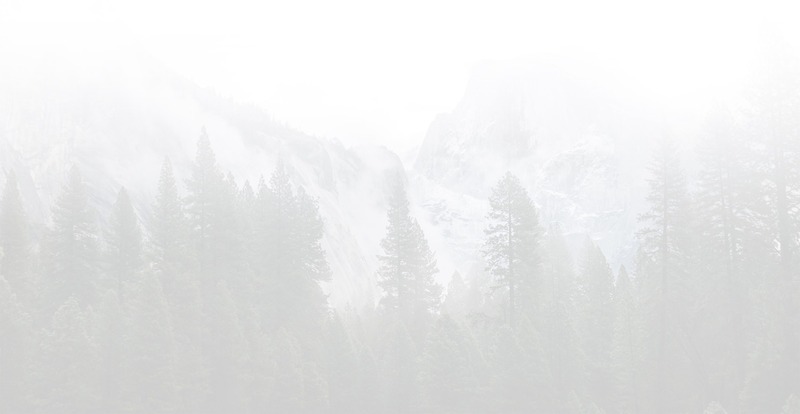 The Dachigam National Park has been a protected area since 1910, first under the care and patronage of the Maharaja of J & K and later under the observation of the concerned government authorities. The name of the park literally means "ten villages" probably in memory of the ten villages that were relocated for the formation of the park. It was finally declared a National Park in the year 1981. Although the Dachigam National Park is the last proper home of the Hangul, or Kashmir Stag, and harbors many rare species within it's borders, it was initially created to ensure clean drinking water supply for the city of Srinagar.